Select from below and order online with your credit card using our secure system or with PayPal. If you are using American Express, please use the PayPal option. You do not have to be a PayPal member. We ship around the world. You can also purchase “Building With Awareness” from your local bookstore. 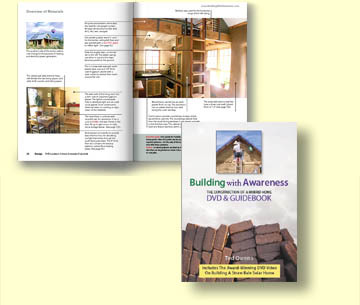 You can either order directly from us, or you may be able to purchase “Building With Awareness” from your local bookstore as it is distributed in Canada. Media Mail is the least expensive way to ship within the U.S. During the holidays, it can also be very slow and take 1-2 weeks or more to arrive. Priority Mail should arrive within 3-4 days. You can review various shipping metnods and prices before committing to the order. International orders commonly arrive in the country within 5 days. It may then take an additional week or more to go through customs of the country being shipped too. Great Britain and Canada are usually fairly fast. 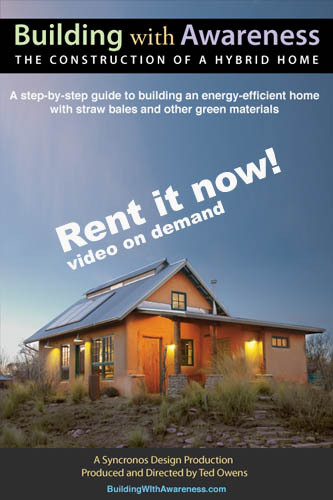 • Includes the award-winning DVD video with over 5 hours of information on building a straw bale solar home. • 152 page book with 400 full-color photographs and diagrams. Cover Size: H 7.5″ x W 5.375″. Only $4.99 for a 30 day rental or $9.99 for unlimited streaming. This is the same video that comes with the book and DVD combo. Running time is 2 hours 42 minutes. It does not include the second audio track with additional commentary or any of the other bonus material on the DVD. 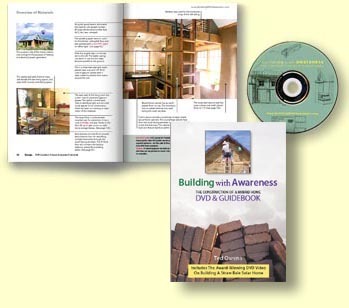 For those who have already purchased the Building With Awareness DVD video. Please note that even though the cover says “DVD and Guidebook”, you will receive the guidebook only. Shipping prices start at $3.60 depending on location and selected delivery service. This item is temporarily unavailable please check back at a later date or contact us.